ARLINGTON, Virginia (CNN) -- Democrats mounted a nationwide effort Saturday to try to harness the grassroots support that helped propel President Obama's campaign and use it to push for his administration's initiatives. 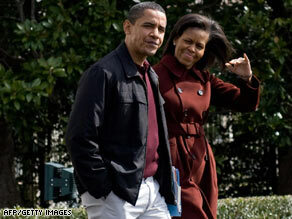 As Democratic volunteers met Saturday, President Obama and his wife, Michelle, flew to Camp David. Volunteers met in 1,200 to 1,300 locations across the country, organizers said -- from a library in Arlington, Virginia, to a park in Brooklyn, New York, to homes and restaurants in California. In some, participants discussed the president's agenda. In others, they set out to homes, subway stations and farmers' markets, asking people to sign forms in which they pledge support for "President Obama's bold approach for renewing America's economy" and commit to asking friends, family and neighbors to do the same. He urged supporters "to head out this Saturday" and "stay involved in the days ahead" by writing letters and making phone calls. Saturday's project is the first concrete effort by the Democratic Party's new "Organizing for America" initiative to use the network of volunteers to help build and push the administration's agenda, although last month the group did host house parties where the proposed stimulus bill was discussed. Through the information gathered Saturday, organizers can continue growing the vast database of supporters' e-mail and text addresses. The Obama campaign's list of supporters was transferred to the "Organizing for America" effort. But whether the success seen by the Obama campaign in signing up supporters can be replicated in support of a policy agenda is an open question. Some organizers and volunteers admit it will be a hard sell, since the drive lacks the excitement and timeliness of a presidential campaign. At the meeting in Virginia, attendees were told "the campaign continues" and were asked how they as citizens could "keep it going." Some of the people stopped by the canvassers at a Virginia subway station told CNN it would be easier to build momentum for the new initiative if it were focused on one specific item, such as the effort to reform health care, rather than around the broader agenda. Several said they had volunteered for the campaign but so far have not gotten involved in this new program. Some others, including three women just out of college and a husband and wife from Indiana who had not done work for the campaign, signed the petitions. They pointed to the bad economy as a reason they would consider working to support the president. The success of this type of initiative will greatly depend on the energy and determination of volunteers like Sergio Salmeron, who started a Washington-area club after the election for supporters of the president's policies. His effort Saturday afternoon brought together about 16 people, discussing everything from health care reform and whether the president is being inclusive, to foreign policy and whether the administration is on the right track, to the economy. Mike Signer, who volunteered for the campaign and advised the transition, told the group, "You all are foot soldiers." "[Obama} will need your help to win this fight," Signer said. Then about half of that group set out to seek signatures at subway stops.